Oliver joked the MBE would get him "out of paying for parking tickets"
Celebrity chef Jamie Oliver attended Buckingham Palace on Wednesday to collect an MBE from the Queen. The 28-year-old from Essex, who is known for his Naked Chef and Jamie's Kitchen television programmes, turned up at the palace without a tie, saying he was told to "wear whatever you're comfortable in". He received his award after training 15 disadvantaged youngsters to be chefs. The highs and lows of working with the trainees was documented in a Channel 4 series, and showed the strain Oliver was under as he ploughed his own money into opening his London restaurant, Fifteen. "I thought I was a bit too young to receive an honour," said Oliver, who was accompanied by wife Jools and his mother and father. "I wasn't going to do anything to celebrate but all my friends said I was boring so I'm having a party with an Elvis impersonator." Oliver, who recently said he hoped his MBE would get him "out of paying for parking tickets", was joined at the palace by fashion designer Alexander McQueen, from north London, who received a CBE. McQueen, wearing a kilt and tartan sash, said: "I'd describe the clothes I design as avant-garde, modernist with traditional roots. "I started as an apprentice tailor on Savile Row, where I made suits for the Prince of Wales." 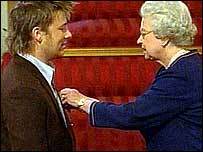 Simon Keenlyside, an opera singer, also collected a CBE at the investiture and wine writer and broadcaster Jancis Robinson was given an OBE. Country singer Sydney Devine, 63, who has spent a decade fundraising in Scotland for Marie Curie Cancer Care, has received an MBE.